After getting our broken awning stowed and secured with duck tape, we left Castle Rock, Washington and drove north to Mount Vernon for repair. After a false start at the local Camping World, techs at Poulsbo RV in Mount Vernon removed the awning apparatus and the insurance claim was begun. Unfortunately, our Mount Vernon campground was fully booked and we had to leave after just two nights. Knowing the insurance claim and new awning order would take weeks, we decided to continue north to the Bellingham area where we hope to have more pleasant temperatures than the high 80s we had since we were in Eugene, Oregon. The first few days in Bellingham were filled with angst over the repair schedule and we argued about how to handle the whole situation. I suppose we were feeling the pressure of having been forced to leave the area without a clear understanding about how the schedule will work out. Repairs while traveling can be a nightmare. 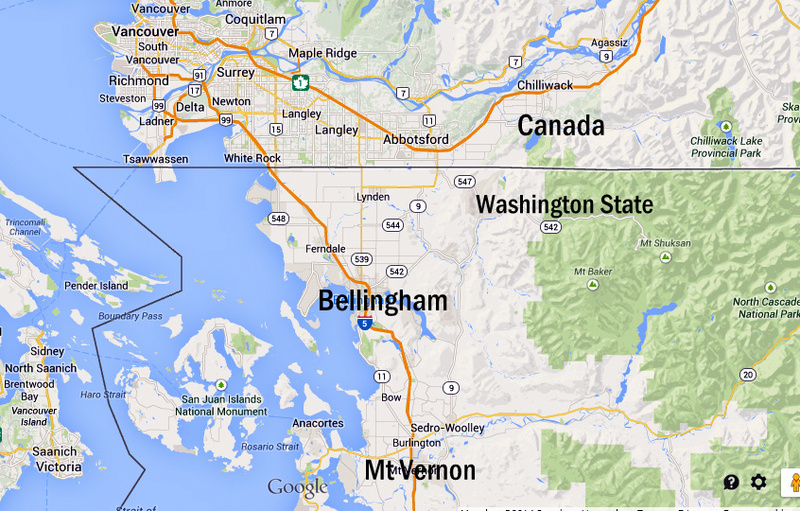 But Bellingham turned out to be a good base of operation for awhile. Early on, we had two days of mist and rain but they were followed by many days of sunshine and mild summer temperatures. With lots of our favorite retailers nearby, we took advantage of some summer sales. We do, after all, wear the same seasonal clothes year 'round. Just 30 miles from the US/Canadian border, we've come to look upon Bellingham as a "little Canadian metropolis" as shopping is plentiful here and there are as many British Columbia license plates as Washington state ones. We've seen dozens of Canadian license plated cars filled to the brim with goods on their way back across the border. I read a that prices in Bellingham are higher than the national average for that reason but I never noticed anything being overpriced. One store clerk said 75% of the area sales are to international buyers. Someone else said the Bellingham airport served more international than domestic flights. As we shopped, I heard as many foreign languages as English. As it turns out, the insurance company requires an adjusters evaluation on both the broken awning and the coach so days turn into weeks before the replacement parts can even be ordered. At this writing, we're into our second full week in Bellingham.